Dovyn Aren is an aging Dunmer nightblade residing in the northeast section of the Elven Gardens District in the Imperial City. He is a retired member of the Thieves Guild although he still possesses all the benefits of being a Cat Burglar. Despite his age, he can still provide basic training in Alteration, a fact that amuses the population of the Imperial City to no end. He lives his life of leisure in a peaceful fashion and spends most of his time hanging out with his old friend from the guild, Fathis Ules. He sleeps on the second floor of his house every day between 5am and 11am. After waking up, he spends an hour on the ground floor before heading outside for a stroll in the Elven Gardens District. He returns home at 4pm for another hour of relaxation before he travels to the Talos Plaza District for an exclusive dinner at the fashionable Tiber Septim Hotel. He leaves the hotel at 7pm and will then actively seek out Fathis Ules who can be a tricky one to find. Please check this section for details. He will follow his friend around all night long until he goes back to his house and finds his bed at 5am. After Legacy Lost, when Fathis moves permanently to Chorrol, Dovyn will stop following him and spend the evenings and nights wandering around the ground floor of his house. He will offer his services for one hour after waking up and from 4pm until his bedtime. On the 22nd of each month, when the clock strikes midnight, Dovyn will leave the Imperial City for his monthly journey to Cheydinhal. He crosses the Talos Bridge and heads north on the Red Ring Road, all the way around Lake Rumare, until he turns northeast on the Blue Road. The trip takes him approximately sixteen hours and he usually arrives at Cheydinhal's western gate between 4pm and 5pm. Once there, he heads directly for the Cheydinhal Bridge Inn and spends the next two days hanging out with the upper-class regulars and another visitor from the big city, Herminia Cinna. At midnight on the 24th, he leaves the inn and returns to his usual routine in the Imperial City. Until his departure from Cheydinhal, his services will still be available all hours of the day. He wields a steel longsword and wears a pair of burgundy linens and pigskin shoes. He also carries a pair of leather boots and a leather cuirass, both of which he will equip during the day. He carries his house key and a small amount of gold. He knows the standard nightblade spells, with additional major Alteration spells. When you meet Dovyn for the first time he will introduce himself, his services, and the fact that he is getting up there in years: "Dovyn Aren. Yeah, I still do training. I'm not what I used to be, but I can still teach Alteration just fine." 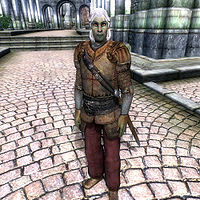 When asked about the Imperial City, he will say: "I was in the Thieves Guild. But I'm out now. I retired. Too old for that foolishness. I don't keep up contacts. You get out? You stay out." "Do you want to learn about Alteration? Speak with Dovyn Aren." "Does Dovyn Aren still teach Alteration?" "I understand old Dovyn Aren can still teach a bit about Alteration." "I know that Dovyn Aren is getting up there in years, but he still knows a bit about Alteration." "He still teaches others, though. Of course, you have to try to avoid all the Old Man Dust." "He's getting older, but he can still teach a bit about Alteration. He's been teaching it since before the Levitation Act of 421." "He still teaches, though he lost his passion for it after the Levitation Act was passed. Can't say I blame him." Before the Thieves Guild quest line is complete, Fathis sits on his vendor chest behind his house in the Elven Gardens District. After the completion of the quest The Ultimate Heist he can be found inside Dareloth's House in the Waterfront District, at the top of the stairs outside the Guildmaster's Quarters. On Sundas from 7pm to 11pm he goes to the Temple of the One in the Temple District. Fathis will keep doing this even after the Thieves Guild quest line is completed. If you cannot find Fathis and Dovyn in any of these locations, it might be because of a bug that causes Fathis to stay inside Dul gro-Shug's house in the evening. If that is the case, Dovyn can be found patiently waiting outside. He has the same last name as Fathis Aren. However, there is no indication in the game that the two are related. Esta página foi modificada pela última vez à(s) 05h24min de 20 de outubro de 2015.